The Lives Of Geniuses: Five Brilliant Biographies These five books take us inside the minds of a founding father and the father of the iPod; the vexing artists who brought us Starry Night and Slaughterhouse-Five; and the couple whose scientific discoveries changed the world in awesome, and awful, ways. What separates a genius from somebody who's just really smart? Opinions vary, of course, but the philosopher Arthur Schopenhauer was probably onto something when he wrote: "Talent hits a target that no one else can hit; genius hits a target no one else can see." Intelligent people aren't all that hard to come by — just turn on Jeopardy! or drop by your local spelling bee — but real geniuses are exceedingly rare, and any given generation is lucky just to have a handful of them in their midst. It's difficult to know what makes geniuses tick, but five biographies this year do a particularly great job chronicling the lives and careers of some of the world's best-known prodigies. These books take us inside the minds of a founding father and the father of the iPod; the vexing artists who brought us Starry Night and Slaughterhouse-Five; and the couple whose scientific discoveries changed the world in awesome, and awful, ways. Though none of them is still living, it's safe to say that their genius will live forever. James Madison was the fourth president of the United States, but he's most likely best known as "the father of the Constitution" who helped bring America the Bill of Rights. In his biography of the diminutive statesman, Richard Brookhiser argues that Madison was more than that — he was also the father of American politics. Madison co-founded what was then called the Republican Party (the precursor to today's Democratic Party) and was one of the first Americans to notice — and harness — the power of public opinion. While some books about the founding fathers tend toward hagiography, Brookhiser's portrait of Madison is fair-minded but sometimes critical — he takes a somewhat dim view of Madison's two-term presidency, but still treats his subject with respect and something like admiration. Brookhiser is a remarkable biographer — there are no wasted words in this slim volume, but plenty of fascinating insights into the patriot who "glimpsed our world before it existed." The stereotype of the brilliant, tortured artist exists for a reason — unfortunately, genius and mental illness often go hand in hand. That was definitely the case for Vincent van Gogh. Steven Naifeh and Gregory White Smith call him "a wayward, battered soul: a stranger in the world ... an enemy to himself." The authors do a brilliant job following the Dutch painter's career, from the line drawings of his youth to the post-impressionist masterpieces that changed the world of art forever. Van Gogh: The Life has already stirred up controversy — the authors argue (very convincingly) that the artist did not commit suicide, as most historians have maintained. Whether or not that's true, the book remains an essential, beautifully written look at the man who saw things nobody else ever did — as he himself put it, the "traveler going somewhere and to some destination ... [that] do not exist." 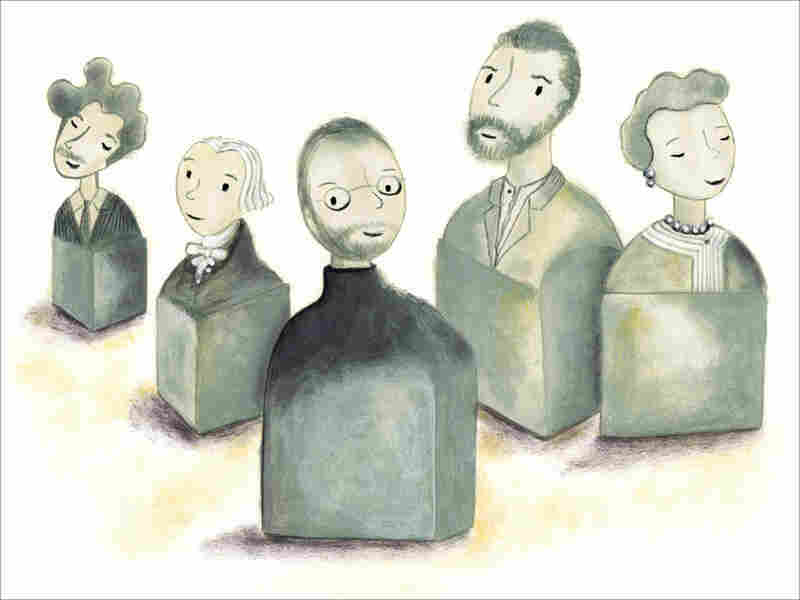 When the Polish-French scientist Marie Curie reflected on her fame, she was nonplussed: "When they talk about my 'splendid work' it seems to me that I'm already dead — that I'm looking at myself dead." Five years later, she passed away, killed by the radioactive materials she and her husband, Pierre, spent decades studying. Their discoveries would later be used to treat cancer, but also to wage a new, unspeakable type of war — the couple changed the world in good and bad ways even they might not have been able to anticipate. Lauren Redniss' biography of the Curies is fascinating, heartbreaking and indisputably original — the text (printed in a font designed by Redniss) is accompanied by the author's stunningly beautiful artwork, in radiant shades of blue, green and orange. It's not often a critic gets to say this, but there's never been a book quite like this before. Even in the infancy of his career, nobody ever knew quite what to make of Kurt Vonnegut Jr. His earliest books were given lurid covers and marketed as low-grade pulp fiction, sold in bus stations and drugstores. Even now, the Indiana-born writer divides tastes. His masterpiece, Slaughterhouse-Five, is widely considered to be one of the best war novels ever written, but his dark tone and oddball sensibilities continue to confuse readers whose tastes tend more toward the conventional. In the first authorized biography of the cult-hero author, Charles J. Shields brings us a captivating account of Vonnegut's life, from his days as a World War II prisoner of war in Dresden, to his final days living in New York (where he would die in 2007). Shields presents Vonnegut as a maddening figure, who wrote frequently about the importance of human kindness but was often mean, ill-tempered and unfaithful to his family. Like all people, he wasn't perfect — but he was never less than wholly original. And So It Goes proves to be a fascinating portrait of a fascinating man. After Apple co-founder and CEO Steve Jobs died just over two months ago, President Obama noted, "There may be no greater tribute to Steve's success than the fact that much of the world learned of his passing on a device he invented." Indeed, there's no doubt that the man responsible for the Macintosh computer, iPhone and iPad forever changed the way the world communicates. In his new biography of Jobs, Walter Isaacson explains how the skinny teenager with a fondness for pranks and LSD became one of the most influential inventors in American history. It's not always pretty — Jobs had a notorious temper, and made plenty of personal and business mistakes on his way to the top. Isaacson knows his way around difficult geniuses, though — he's written biographies of Benjamin Franklin, Albert Einstein and Henry Kissinger — and he tells Jobs' story with impressive narrative drive. Steve Jobs is gone, but his legacy endures: not just in every gadget he invented, but in the generations of Americans he taught to "think different." Michael Schaub is a regular contributor to NPR.org. His writing has appeared in The Washington Post, The San Francisco Chronicle, The Portland Mercury and The Austin Chronicle, among other publications. A native of Texas, he now lives in Portland, Ore.